Ally, the protagonist of Lake Surrender, is jobless and homeless and must move cross-country with her teenage daughter and autistic son in tow, leaving the sun and warmth of California to live with her aunt in the heart of the Michigan winter. With her life seemingly torn apart, she finds renewed hope and a faith in God when she takes a job as a camp cook. Readers will relate to Ally and the decisions she has to make and parents of children on the autism spectrum will relate to Ally as she struggles to nurture an autistic child. 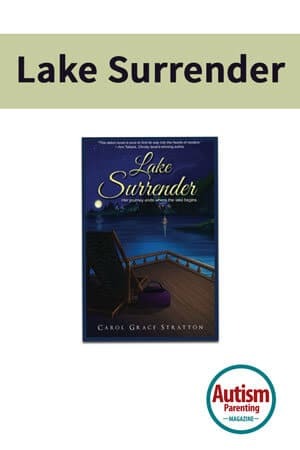 Lake Surrender is a romantic mystery fiction novel that centers around a fictional Christian camp in Michigan. The book is available on Amazon.com, at BarnesandNoble.com. “I’ve had my happiest memories sitting on the rustic porch of a camp lodge. I knew a rustic church camp would be the perfect setting for a mystery and a romance,” says Stratton about her book. This is a second book for Stratton and her first work of fiction. Her first book, Changing Zip Codes, is about finding a sense of community in spite of frequent moves and is also available on Amazon.com and BarnesandNoble.com. Carol has been a freelance writer for 14 years writing over 200 articles and is currently a reporter for the Mooresville Weekly. She has a degree in Recreation Therapy and has worked with autistic children in a classroom, an experience that inspired her to write about a woman with an autistic son. She speaks at national writing conferences as well as MOPS and other women’s groups about personality temperaments, friendship and encouraging yourself. Thank you Autism Parenting Magazine for giving a shout out to my novel. I have a heart for any parent parenting special needs children and wanted to write a story to honor them and let an autistic child in a story, shine. My guy Benjie becomes a hero in Lake Surrender- but you are my heroes, parents!